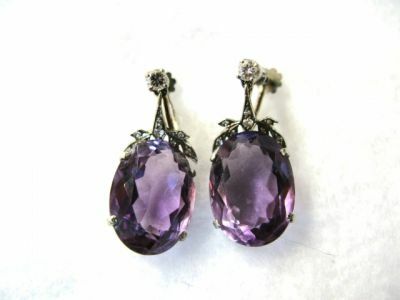 One pair of 18 karat white gold drop earrings, featuring 2 claw-set oval facetted amethysts, est.22.03cts (clarity: LI & colour: medium intense purple); 16 bead-set single cut diamonds, est.0.15cts. ( VS clarity: H colour) and 2 round brilliant cut diamonds, est.0.25 cts (VS clarity: G-H colour). They have ther original screw-backs but could be changed for pierced ears.